Location: Intense hike for 43 km - 26.7 ml. The Inca Trail was superb. They gave us a 3 course meals in a tent that was equivalent to a good restaurant – even baked a birthday cake! What an experience, never to be forgotten – thank you all so much. This classic Inca Trail to Machu Picchu is one of the world’s greatest adventures. During the Inca Empire, the trail served as a kind of royal highway, linking Cusco with Machu Picchu. This trail traverses across the magical Peruvian Andean mountains, taking in long Inca stone stairs through the Amazonian rain forest. It features ancient storage buildings, houses, temples with strategic observatories along the way, that allow you to see breathtaking views. Distance to cover: 12 km – 7.45 miles during a 5 to 6 hour hike. The Inca Trail to Machu Picchu begins at 6 am, where guides collect the passengers from their hotels. After two hours’ driving through the beautiful villages of Chinchero, Maras and Urubamba, we arrive at Ollantaytambo. Here, we will have a little break before we begin the last bus ride to the starting-point of the hike to Machu Picchu. Piscacucho (Km 82) is the final destination and the Inca trail checkpoint, the start of the hike. Here we will meet our porters and camp staff for the trail. While our porters load the gear, the group can go ahead and start hiking downriver, alongside the rushing Vilcanota River through beautiful cactus, gardens, and Andean farms with a magnificent panorama of the Salkantay mountain “Wild mountain” snow peak. A little later, we will arrive at the Inca complex of Patallacta (“Town on hillside”), where some time will be spent exploring this site before continuing with the hike on the Inca Trail. Our next destination will be the Cusichaca (“happy breach”) Valley and Huallabamba, our camp for the night. Distance to cover: 8.8 km – 5.47 miles / 6 to 8 hours. This day is the most challenging part of the hike on the Inca Trail to Machu Picchu. We take a steep ascent towards the highest point of the trail. Vegetation changes constantly while hiking, and we can appreciate a variety of native plants such as Icchu and the beautiful Queuñas – one of the few tree’s that has adapted to altitudes above 3,000 meters. Ascending steadily for couple more hours, we will arrive at the mountain pass called Warmiwañusca (“Dead Woman’s Pass”) on the classic Incan Trail. Warmiwañusca is the highest point on the Inca Trail, located at 4,200 m or 13,776 ft. above sea level. On this portion of the trail, there are amazing views of the Andean mountains including Mount Veronica. The hike then continues, descending to Pacaymayu at 3,600 meters, where we set up our second camp. After a hearty breakfast, the third section of the Inca trail to Machu Picchu tour begins. It will take one hour and a half of gently walking uphill on a well-preserved, paved Inca trail with spectacular sculptured stairways until reaching the small complex of Runkurakay. After a short stay we slowly climb the second pass of Runkurakay at 3950 meters – 12960 foot. Continuing along this Inca stairway, we cross the pass and head down to the major and spectacular sites of Sayacmarca (“Inaccessible Town”), a colossal Inca complex located atop a cliff for lunch, where our guide will speak about Inca architecture and life and the various mysteries of this ancient culture. We continue along a well-crafted paved Inca road, passing through a cloud forest with many beautiful orchids until we arrive at the impressive Inca ruins of Phuyupatamarca. Where we stay for a few more hours and then we go to Wiñay Wayna (“Forever Young”), the last official camp of the Inca Trail, where you can buy refreshments, water, beer, etc. Distance to cover: 4.67 km – 2.9 miles / 2 to 3 hours. The day that everyone is waiting for! It takes two hours walking on the Inca Trail through the cloud forest to get to Intipunku (“The Sun Gate”). 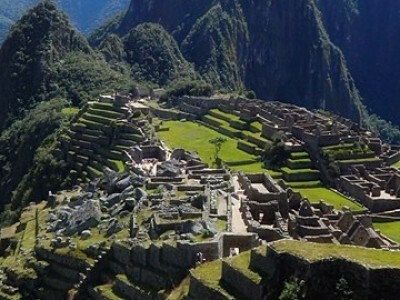 This is where we can get our first breathtaking and impressive views of Machu Picchu citadel. The trail will continue for some more minutes until we arrive at the famous citadel itself. Machu Picchu is the highlight of the Inca Trail. The complex is large and well-preserved. One of the most astonishing things about Machu Picchu is the incomparable view. This fortress is surrounded by incredibly steep mountains, thick Peruvian jungles and winding rivers. Later after this great tour on the classic Incan Trial, we will meet with the rest of the group at the bus station and travel to Aguas Calientes to take the train to Ollantaytambo, where we transfer to a bus to Cusco. Hiking distance: 4.67 km – 2.9 miles / 2 to 3 hours. The Inca Trail to Machu Picchu is ranked amongst the world’s ten best hiking trails due to its stunning beauty, diverse ecological zones and most importantly the impressive ancient Inca ruins located strategically along the trail. The ultimate destination on the Inca Trail is the Lost City of the Incas “Machu Picchu” one of the world’s most astonishing and remarkable archaeological sites and one of the Seven Wonders of the World. Patallacta is the first Inca complex on the classic Inca Trail, located just 6 km from the Urubamba River and the Inca trail check point. The survey by the American Hiram Bingham during 1911 and 1912 was concentrated on Machu Picchu and only identified a handful of relatively accessible sites on the Inca road. When Bingham returned to the area of Machu Picchu in 1914 aimed at locating additional Inca sites along Inca roads, his expedition concentrated mainly on the excavation of the complex at Patallacta (Upper town or Town on the hillside, ca. 2,500 m above sea level). This Machu Picchu complex is a miracle of engineering in respect to its size and well-planned layout, it is set on an artificially leveled platform carved out of a semicircular ridge overlooking the confluence of the mighty Urubamba and Cusichaca Rivers. Recent studies suggest that Patallacta was an important local Incan administrative center. This complex consist of 115 walled compounds, each composed has four structures surrounding a central courtyard that were divided into four separate residential zones. This complex contains the small but well-preserved fortress of Paucarcancha, the place where Hiram Bingham’s excavated 200 hundred skulls and at least half a dozen human mummies. On the classic Incan Trail, you will be surrounded by history. Cusichaca was the subject of many archaeological excavations and also botanical studies because of its rich plant life. Experts also studied modern coil pottery and other wares in the locality. Excavations were made in five neighboring sites in the Cusichaca area. This area was also the subject of agricultural studies. Rain fed Inca terraces were designed to take advantage of natural features (e.g. alluvial fans). These terraces hold only limited soil since Incan terraces were built with heavily modified terrace fills. Huayllabamba is an Andean community located a few hours from the start of the Inca Trail to Machu Picchu. Before tourism arrived, the inhabitants of Huayllbamba together with other Andean communities located along the Inca trail, were subsistence farmers, each one of them are owners of a third of a hectare of agricultural land in the lower and on the higher parts of the Andean Mountain. Currently the Andean villagers who are living along the Inca Trail still practice subsistence farming, as their Incan forbearers did. However, others are using new strategies gains coming from the success of the tourism. The classic Incan trail still gives the visitor a real sense of how the Incas lived. The residents of the Huayllabamba community were in fact the first porters who worked for companies that guided tourists during the 1970s. Since then, men have been working as porters carrying tourists back packs from camp to camp specially from Huayllabamba campsite to Warmiwañusca, perhaps the most challenging section of the Inca trail. The highest day, the hardest day. The day that made you ask yourself over and over, “What the hell was I thinking? Walking at altitude can be tough but Machu Picchu and the other sights make it all worth well. One name that hikers won’t be able to get out of their heads is “Dead Woman’s Pass” (Warmiwanusca pass) located at 4,198 meters or 13,779 feet the highest point of the Inca trail to Machu Picchu. Depending where your first night’s camp is located, the hiking distance is approximately from 6 to 10 Kilometers long. 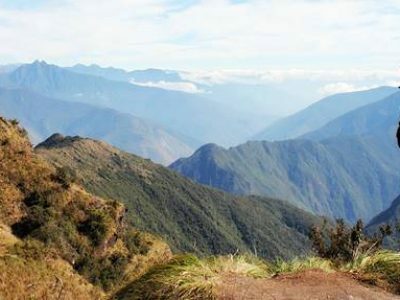 This hike is a vertical 1,200 meters – 4,000 feet accent, the elevation become more important as you hike uphill. But relax, Warmiwañusca does have a top, and after hours of walking uphill, you will make the summit. 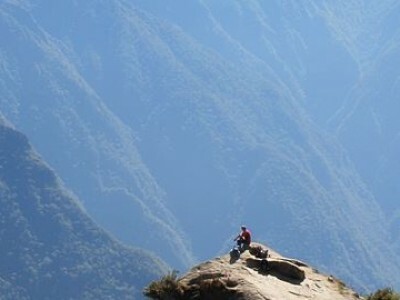 It will be at that moment that make the Inca Trail so special. This complex was discovered by Hiram Bingham in 1915, on his expeditios following the Inca trail. You too can follow in the footsteps of the great American on the classic Inca Trail. While hiking you will see Sayaqmarca, which was known by the locals as Cedrobamba (“Pampa of Cedars”) since there was a cedar forest close to this site. In 1941, Paul Fejos, launched a new expedition in this area, during which he changed the name to “the Inaccessible Town”. This name perfectly matches perfectly the location of the site, as this place is located atop a mountain and is inaccessible on the sides by steep drops. The Sayacmarca complex is located at a height of 3,600 meters – 11811.02 ft. perfectly built to rest on the steep slopes of the hillsides. The third camp on the Inca Trail to Machu Picchu, is Pacaymayo. Its name originates from the Quechua word Pakaymayu or Paqaymayu and is a small tributary that flows into the Urubamba River. Near to Pacaymayo is the Warmiwañusqa pass and the archaeological complex of Runkuraqay. This camp site is located at 3,600 m – 11811.02 ft.
Runkurakay was found by Hiram Bingham in 1915, who concluded that this complex was a fortress. A later expedition, led by Archaeologist Paul Fejos, suggested that Runkurakay was a rest and supply base for the “Chaskis” – runners that delivered messages throughout the Inca Empire. They once ran the Inca Trail at great speed to deliver the Emperor’s messages to Machu Picchu. The structure contains peculiar concentric and inclined circular walls, egg shaped and box structures, designed to withstand up to earthquakes. The Runkuraqay precinct also contains several dormitories and stables for animals. Runkurakay is a Quechua word and means “egg-shaped” (Egg shaped house). The complex lies on the hill adjacent to the Runkuraqay mountain near the Runkuraqay pass and also the Sayaqmarka and Qunchamarka archaeological sites. This is one of the most interesting sites on the Inca Trail to Machu Picchu. Phuyupatamarca means City Above the Clouds and is located at 3,670 meters – 12040.68 foot above sea level. This site contains one of the most well-preserved ruins on the Inca trail including scenic farming terraces, fountains with fresh water running constantly even during raining season, curved vantage points, and an elaborate series of baths connected by water channels. Wiñay Wayna (or Huinay Huayna) is the last campsite on the classic Inca trail to Machu Picchu. This complex was discovered by the Wenner Gren Scientific expedition, which explored archaeological remains and native Andean communities in 1940. Subsequently, Paul Fejos during expeditions, discovered a number of sites close to the Inca trail to Machu Picchu. The Wiñay Wayna ruins (“Eternal Youth – Forever Young”) were discovered and named by the Peruvian archaeologist, Julio C. Tello, and the site is located at 2,690 meters – 8,825 foot. This complex contains a large area of farming terraces, upper and lower structures each connected by a long stone staircase, with fountains and baths. The elaborate architecture of this complex suggests that this place was important during Incan times. Camping gear: Four seasons and double occupancy tents, dinner tent, kitchen tent, dining tent, tent for porters and cooks, sleeping mattress, cooking equipment. First aid: First aid kit, including emergency oxygen bottle. Fees: Entrance fees to Inca Trail, train ticket to Cusco. Transport: Train backpacker cerrojo, from Machu Picchu to Cusco, transfers to and from train station, bus terminal to hotel. Staff: Porters to carry the tents, food, and cooking equipment; experienced cook. The price of the Inca trail to Machu Picchu includes all local sales taxes. Personal porters can be hired to help carry your personal items. The services of a third porter is $70 USD. Still you need to take a day pack or bag to carry your essential items. Note that due to new government regulations, the maximum number of porters that we can use in each group has been reduced. Therefore, we have to limit the maximum amount of personal equipment that you can ask a porter to carry for you to a certain kg or lb. per person. The maximum amount that each porter can carry on the Inca Trail has also been limited to a specific kg or lb. per porter. Approximately 30% of our clients hire the services of a third porter. An extra night in Aguas Calientes can easily be arranged for you if require it. Breakfast on the first morning, lunch in Aguas Calientes on the final day, entrance fees to the thermal springs in Aguas Calientes, sleeping bags (may rent in our office for $16 USD), tips. What to bring for your Inca Trail? Everyday. Guarantee departures with a minimum of 2 people and a maximum of 16 passengers per group. Note: The Inca trail is closed for essential maintenance during February.